Reader Girls is the stop today for The Next 15 Minutes Book Tour. What's the book about? Kim Kircher lived life hanging onto the edge of a mountain. When she wasn’t rescuing wounded skiers as a member of the ski patrol or bombing snow-congested mountainsides to control avalanches, she and her husband, John, were proving to the world that a full life was possible in spite of each living with an autoimmune disorder. Their days were full of early morning runs on perfect powder, slicing through the stellar crystals to the envy of holiday skiers. When John’s congenital liver condition – primary sclerosing cholangitis – approached the terminal phase, Kim was determined to use all of her mountain-borne skills to save him and return them to the adventurous life they both loved. But as his condition worsened and their worst fears became a reality, she knew that it would take more than tenacity. Without a liver transplant, John had nine months to live. 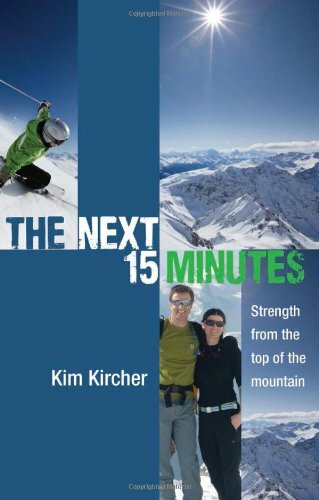 THE NEXT FIFTEEN MINUTES (Behler Publications, November, 2011) offers a rare glimpse into the strange and fascinating world of a ski area professional, where steep terrain and deep snow, the twin fuels that run the business, teach patrollers how to get through the worst trials just fifteen minutes at a time. Kim seized the EMT training that helped her avoid panic when a fallen skier had to be delicately lifted from a tree to manage the life-and-death situation facing her husband. As radiation therapy made John grow sicker it became obvious that he would not have the two to three years necessary to receive a liver from a deceased donor. The race to save John’s life became a gathering avalanche that Kim desperately tried to brake as volunteer after volunteer was rejected as a donor. Desperate to save John, Kim joined the ranks of potential donors, but lurking behind the scenes was her juvenile diabetes. In spite of her expertise in managing her condition, her body simply could not handle the rigors of such surgery. She had survived avalanches, insulin shock in the sub-zero cold and skiing down the treacherous face of Crystal – but she couldn’t save her husband’s life. When all seemed lost, hope arrived in the person of a formerly rejected donor whose personal health improvements made him an ideal candidate. But was it too late? Had the cancer spread and could John’s body, burned by radiation, handle thedelicate and difficult surgery? They would know the answer in the next 15 minutes. About the author: Kim Kircher is an Avalanche Specialist and Ski Patroller in Seattle who helped save her husband as he was dying from liver cancer. She went from dropping bombs in the snow and rescuing mortally endangered skiers to begging nurses to administer more pain meds as her husband was lying in agony at the Mayo clinic. Rallying her skills as an avalanche rescuer, she translated her coping abilities to suit her unthinkable situation, planning life only fifteen minutes at a time to avoid panic. Throughout this, Kim managed her own disease–Type I Diabetes. A true story that reads like a novel, Kim weaves her lessons on the slopes between the unbelievable twists and turns of her husband’s illness. Ski beside Kim as she rushes to find her husband a living liver donor; she has only 9 months to do so before her husband will die from complications. A story of enduring love in the face of unspeakable pain, Kim has created a memoir that will touch hearts and change lives. Our review to come later today.